In early May, the MDWg team visited an important Miriwoong cultural site- Moonamoorem (the Goanna Dreaming). Here, we gathered footage for a film about Miriwoong storytelling. Our Project Linguist, Frances Kofod is recording and producing this film. 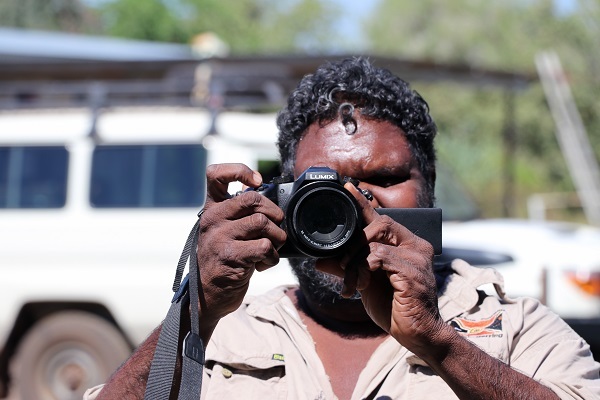 Frances has been working with MDWg staff and Miriwoong Elders to capture stories that are important to Miriwoong people. An important part of this project has also been to encourage younger team members to tell their own stories. We made the journey from Kununurra past the NT border and into Newry Station. Many of MDWg’s staff have a connection to Newry Station, having worked and/or lived there for a period of time in their lives. The team enjoyed the opportunity to revisit those old memories, and to share stories with other team members. Rangers from the Keep River National Park met us at Newry Station, and very generously cooked a ‘killer’ for lunch, which everyone enjoyed. 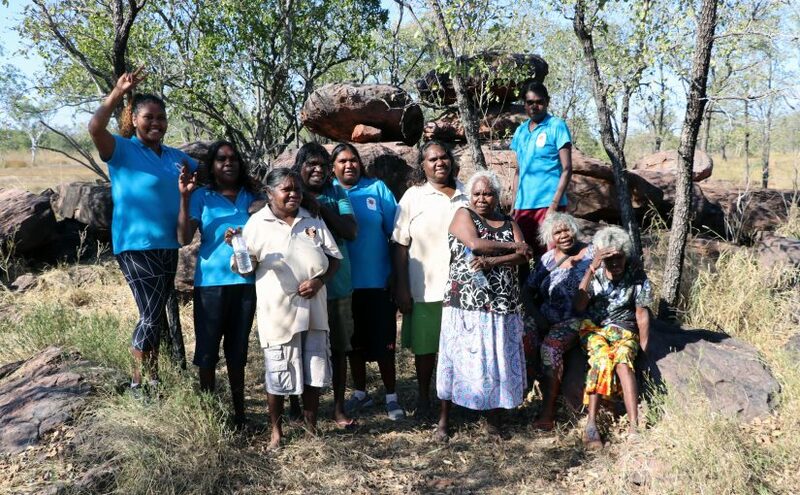 Language Workers and the Miriwoong Language Nest team were filmed speaking and introducing themselves in language. They then listened on as Elders talked about the significance of the area for them. Agnes Armstrong gave everyone a Mantha (water blessing) by the creek, welcoming us to the country. 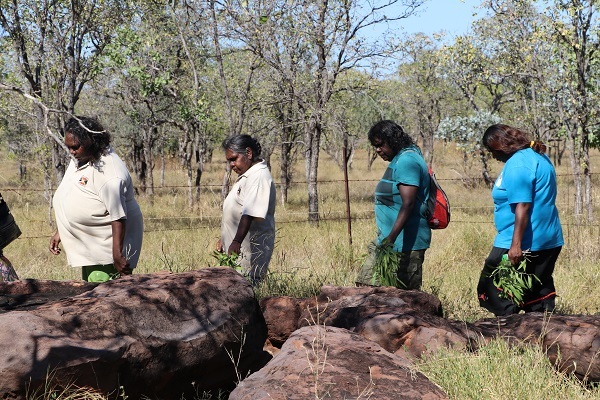 We moved on to the Goanna Dreaming site, where the team walked around the area, paying their respects (pictured below). We sat, talked and listened to Miriwoong Elders, Maggie and Button, sing the song for the area. It was a very special afternoon, and it was great to be able to take such a large team out on country to connect with these stories and memories. 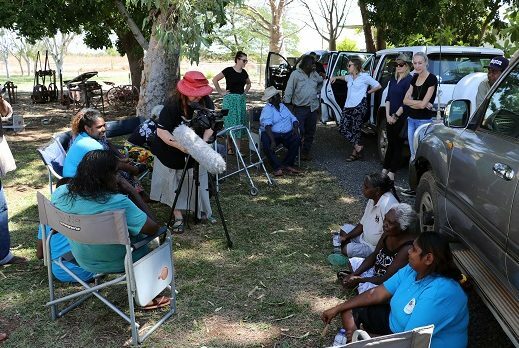 Footage from this trip will form an important component of the film, which will provide a unique insight into Miriwoong storytelling, and what that means for many generations of Miriwoong people. This is the third and final film produced as part of MDWg’s Miriwoong Expressions of the Arts project. It will be released in September, and is funded by the Department of Communications and the Arts’ Indigenous Languages and Arts Program. We look forward to sharing the film with our network of friends and supporters later this year. We hope that by doing so, we can further spread the word about the importance of saving Miriwoong, so that these stories can live on in language.